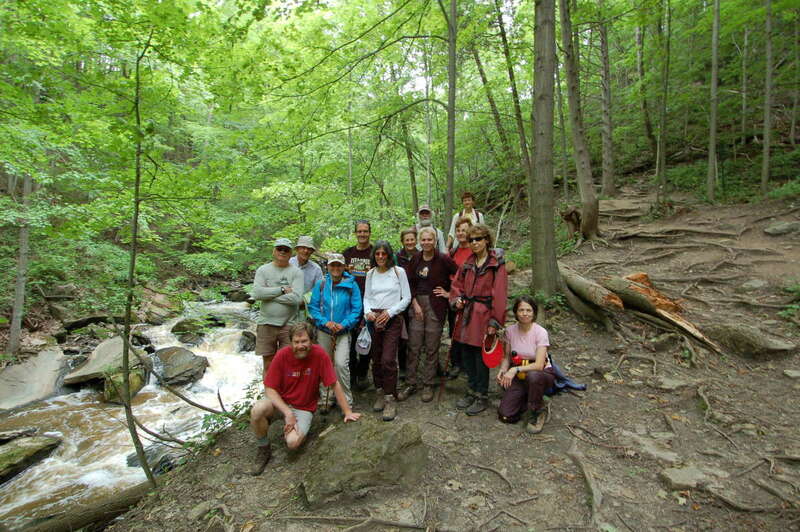 The High Park Hiking Club is for adults, 18 years or older. Otherwise, anyone can join. Memberships are cheap, and they are sold at the hikes and at the seasonal parties. They are good for the spring and the subsequent fall season. The photo was taken somewhere near Grindstone Falls, near Waterdown. To join the club, you can download our membership form. 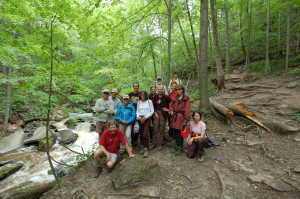 Fill it in, sign the waiver, attach a cheque for the High Park Hiking Club, and mail it to the address on the form. You need Adobe Acroread to read it. To get Acroread, click on the icon below. You can contact us by clicking on the webmaster at the bottom of this page, or by showing up at a hike! High Park Ski Club is no longer running its Fun In The Sun (FITS) night, so from now on, you will have to meet us at a trailhead. Oh well. You can get some quality hiking in!